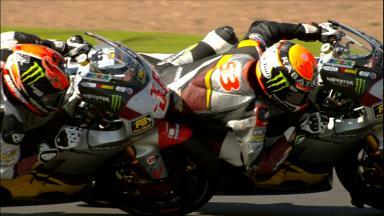 To secure victory in Sunday’s Moto2™ race at Silverstone Tito Rabat had to get the better of a titanic battle with his Marc VDS Racing teammate, Mika Kallio. 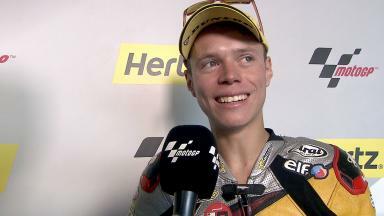 It is the third time in 2014 that the Marc VDS duo has occupied the top two steps of the podium and the victory means that Rabat has now won half of the 12 races run so far, giving him a 17 point lead over Kallio at the top of the World Championship standings. 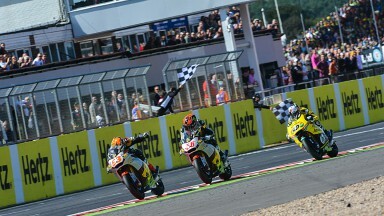 After struggling with both the conditions and set up at Silverstone all weekend, it was a welcome win for Rabat, who was visibly relieved as he pulled up to occupy the number one slot in parc ferme post race. 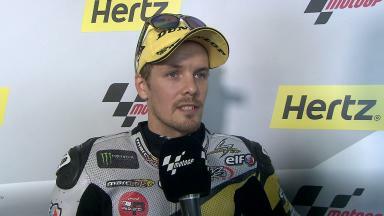 For Kallio there was only disappointment, after losing out to his teammate by just 0.063s in a race he had pretty much dominated until the very closing stages. Despite putting up an aggressive defence on the final lap, the 31-year-old Finn had no answer for his equally aggressive Marc VDS teammate.